When it comes to skincare, I usually divide products into two categories: moisturizing and hydrating. In my point of view, a moisturizing product means that it forms a protective film on your skin to prevent any moisture loss, keeping your skin soft and supple. Aka an emollient. On the other hand, a hydrating product is like a glass of water for your skin, providing lightweight moisture that your skin just drinks up to prevent dehydration. As someone with dehydrated skin, I'm a fan of hydrating products but have always shied away from moisturizing ones because past experiences have taught me that they're no good for my acne-prone combination-oily skin. That is, until now. 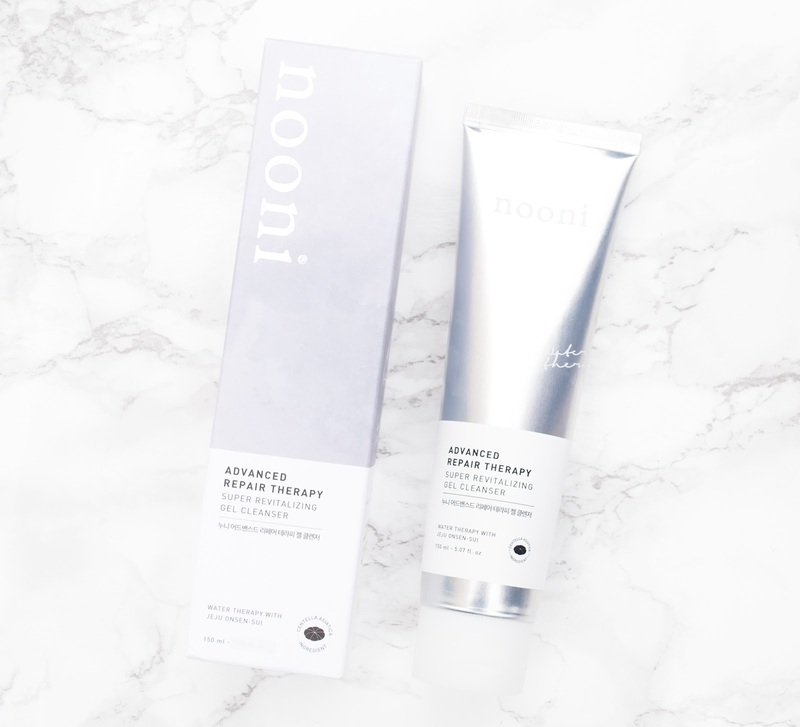 Awhile back I started testing out the Nooni Advanced Repair Therapy Super Vitalizing Cream, which is definitely a moisturizing cream. Upon seeing the product my first thought was "Great, my skin's going to hate this". And it did. Well... sort of. See, when I first tried this cream out, it was during the summer when my skin was being a hypersensitive and oily pain in the neck. I stored the cream away back then and didn't pick it up until late October, when the weather in California finally started to cool down and my skin was behaving better. And along with that I picked up again its partner the Nooni Advanced Repair Therapy Super Vitalizing Gel Cleanser, which I also disliked back then. And this second chance came with somewhat good news and bad news, but let's start with the good one first. 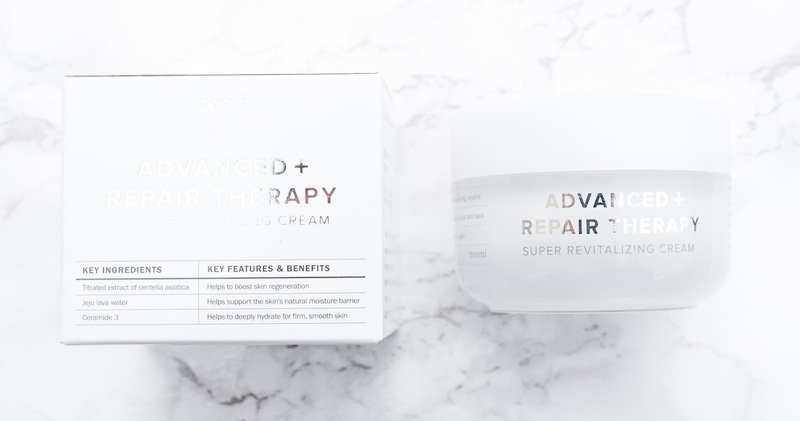 The Advanced Repair Therapy Super Vitalizing Cream renews damaged skin with a high concentration of therapeutic Centella Asiatica, loved for its powers to repair and strengthen. Calendula and Portulaca Oleracea extracts also nourish and soothe, while Evening Primrose Oil calms troubled skin, and Ceramide 3 fortifies. The naturally citrus-scented cream's jelly-meets-balm texture allows these nutrients to soak right into skin to effectively care for and help prevent dry patches, enlarged pores, and other problems. After a quick therapy sesh, your pores will be more refined and your skin more moisturized, revitalized, and firm. The Nooni Advanced Repair Therapy Super Vitalizing Cream is packaged in an opaque, sturdy plastic jar. I personally don't mind the jar, but for those of you who are concerned about hygienic issues, do note that this doesn't come with a spatula. According to CosDNA, there are a few acne triggers and irritants in this product such as cetearyl alcohol, butylene glycol, and glycerl stearate SE. Do not use this product if you're sensitive to any of the ingredients. Let's start off with the star ingredient: titrated extract of centella asiatica, which is composed of asiaticoside, madecassic acid, and asiatic acid. This extract is often used for its wound healing properties. Asiatic acid increases collagen synthesis, making it ideal for healing pitted acne scars since it helps your skin fill up those "dents". Another ingredient in the list that is also known for stimulating tissue growth is allantoin. Some other notable ingredients are ceramide 3, good for reinforcing your skin's barrier and locking moisture in your skin, and evening primrose oil, which helps your skin regulate itself by increasing or decreasing oil production so that it becomes normal. Also to be noted are a couple plant extracts (portulaca oleracea and calendula flower) that are great for soothing your skin. There aren't really a lot of ingredients that were unexpected or concerning. The few acne triggers/irritants included are commonly used in skincare and I never had a problem with them. Also, based on the cream's texture (which I'll talk about later), I expected those ingredients. However, there is one ingredient that really bothers me: the artificial coloring (Yellow 5). It's unnecessary and harmful for your skin, since it's a toxin and carcinogenic. I don't care what my skincare looks like as long as it works, and I'm sure most people feel the same. Luckily I haven't had any negative reactions to this cream, but I'm really not happy that it contains a dye. Let me start by saying that this is a pretty thick cream. It's not creamy per say but almost like a hybrid between a gel and a balm? This is one of those products where I feel the need to warm it up between my hands before applying to my skin. I usually take a pea size amount and rub it between my hands to kinda "melt" it, and then I press it into my skin. What's wonderful about this is that even though it's a thick cream, by melting it first and then applying, it absorbs quickly into my skin and doesn't feel heavy at all. It's never made my T-zone oily, and my pores don't feel clogged like they often do when I use thick creams like this. So thumbs up for the texture of this cream! It does have a very light citrusy scent which I love, and it's not noticeable unless you stick your nose into the jar. Now onto the results. I've used this cream for the past 2-3 months and I really like it for the dry winter weather. It gives my skin just the right amount of moisture to keep it from feeling tight, but it's not too much that it gets oily. In fact, I suspect that this cream is what helped my skin become normal and no longer oily over the past few months. It hasn't caused any breakouts, and it also helps in calming my skin. I can't really comment on its healing properties because I only have hyperpigmentation from my acne, not actual scarring. The description claims that it refines your pores, but it doesn't, and that's okay because I didn't expect it to. When it comes to a cream I just expect it to be moisturizing and soothing without making my skin oily, which is exactly what this cream does. Here's the thing though... I feel a bit conflicted with this cream. While I love the results it gave me, I don't like how it contains a synthetic dye that's harmful to the skin. I probably will not be repurchasing this because of that. If you want to try it out and don't care about the dye, then I'd say go ahead because (despite the dye) it's a wonderful cream that's suitable for all in skin types. In fact, if this didn't contain the dye, it'd be a holy grail. However, unless Nooni stops adding that ingredient, this cream won't be on my recommended list. 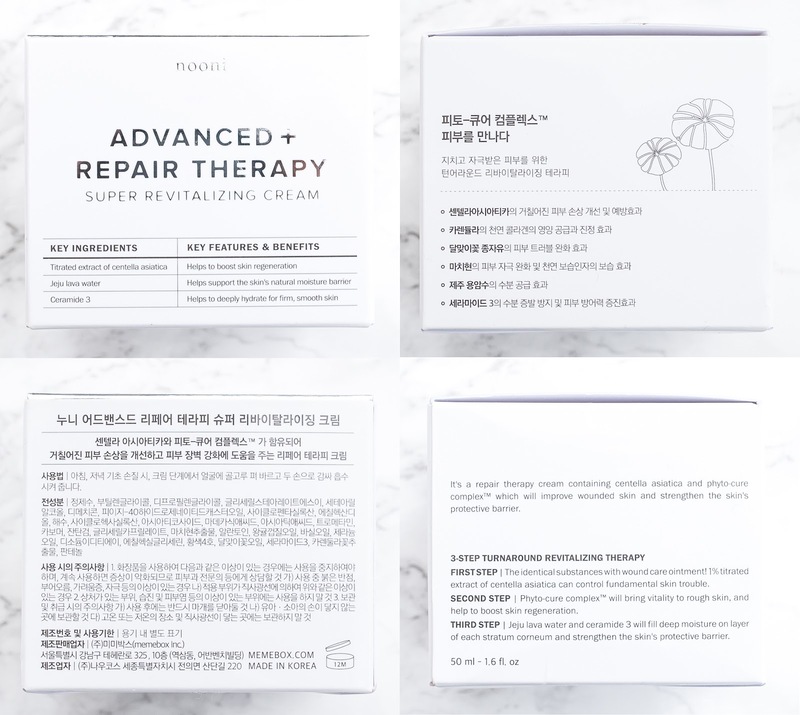 You can purchase the Nooni Advanced Repair Therapy Super Revitalizing Cream at Memebox for $28, which is a markdown from its usual price of $40. Now moving on to the next product in the same line! This refreshing, soothing gel cleanser with a pH of 6 is a heaven-sent for sensitive skin. It's enriched with 60% Centella Asiatica Extract, which calms and relieves irritations and redness. It's also flowing with Carbonated Water from the lush island of Jeju, which fizzles deep into skin to clean and nourish more effectively than pure water from the inside out. Other natural botanical extracts help to moisturize skin, strengthen layers, and improve its overall complexion, leaving skin healthy and ready to soak in the next goodies in your skincare routine. According to CosDNA, there are quite a few acne triggers and irritants in this product, and some ingredients that raise a yellow flag in terms of safety. 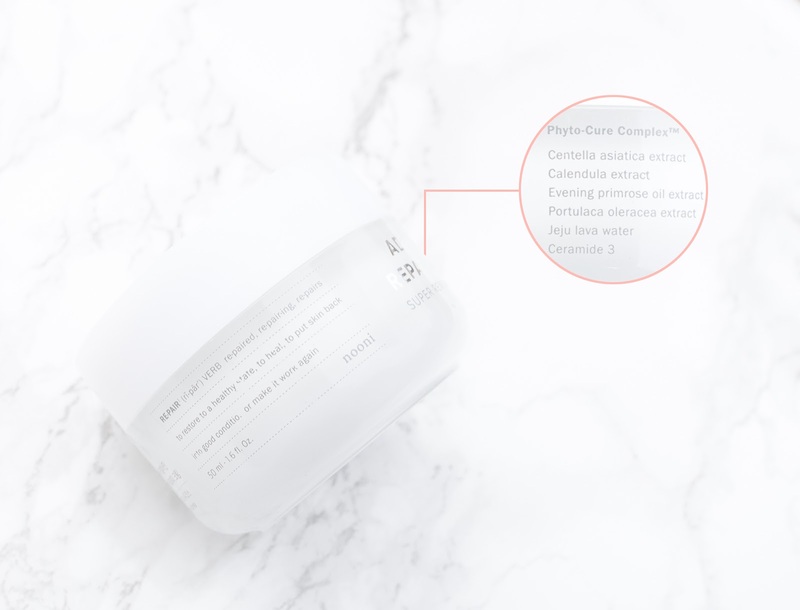 Once again this cleanser also features centella asiatica as a star ingredient, however it only lists centella asiatica extract, not the titrated version. From what I've learned, it seems like if it's just the extract, then it has soothing and antioxidant properties. It may possibly increase collagen synthesis, but I'm not sure. 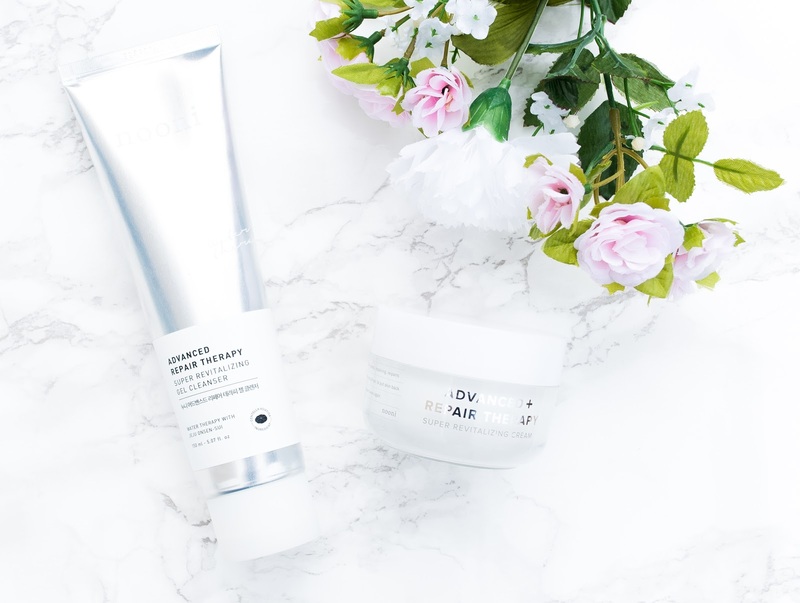 Some other notable skin calming and anti-inflammatory ingredients listed are aloe vera leaf extract, witch hazel extract and licorice root extract. Also to note there are quite a few oils included in this cleanser. I'm not going to go over all of them, but some of them, such as jojoba oil and rose oil are amazing for moisturizing dry skin. Bergamot oil is also great for healing scars and killing bacteria. Salicylic acid is also another ingredient in this cleanser. It's a great ingredient for treating acne, however some people may be sensitive to it. If you know that you're sensitive to salicylic acid, lavender oil, or any of the other ingredients listed then don't use this product. While looking through the list I noticed an ingredient I've never seen before: carrageenan. When used in cosmetics, it functions as a thickening agent. However, it also scores a 5 as a potential acne trigger. That doesn't mean it's an unsafe ingredient, in fact it's pretty safe for topical use, but it can aggravate acne and clog pores for some people. This gel cleanser is one of those non-foaming cleansers that seem to be getting more popular these days. It does have a low pH, so it's good for people who need to use low-pH cleansers. It has a fresh scent that isn't offensive or strong, so those who are scent sensitive should be okay with this cleanser. This was my first time trying a non-foaming cleanser, and... I didn't like this one. Remember how I mentioned that carrageenan can be pore clogging for some people? Unfortunately, I'm one of those people. Whenever I used this cleanser, although the surface of my skin felt cleansed and refreshed afterwards, I felt like my pores were kind of clogged. It did leave my skin feeling soft and well moisturized thanks to all the extracts and oils, but it also gave me some small pimples due to the clogged pores. Luckily I didn't get any major breakouts or cystic acne, and the pimples would go away within a day or two. I was really excited to try this cleanser because I know my skin likes a lot of the ingredients in it, but sadly it wasn't the one for me. I do know that some people really like this cleanser though, so YMMV. 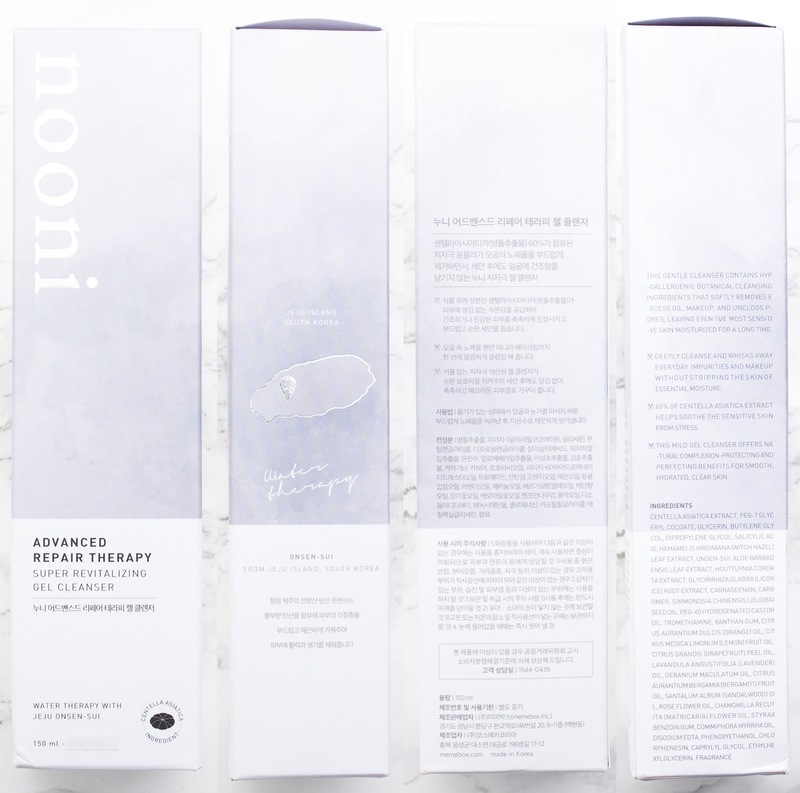 You can purchase the Nooni Advanced Repair Therapy Super Revitalizing Gel Cleanser at Memebox for $15. What do you guys think of the Nooni Advanced Repair Therapy line? The products featured were sent to me by Memebox for review purposes.